Unhatched Eggs - why didn't the eggs hatch? Unusual white bluebird eggs hatching. Photo by Leah. Not all eggs in a nestbox always hatch. 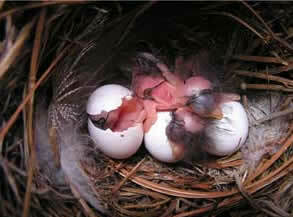 In Eastern bluebird nests, about 17% of eggs do not hatch. (BNA). Cornell's The Birdhouse Network says that 10-15% of nests contain unhatched eggs. Sometimes you don't know an egg didn't hatch because the parent removes it. It could be a new egg from a subsequent nesting if you didn't clean the box out immediately after the last fledging. (More on cleaning.) If you have just one egg, and the female is actually laying again, a new one should show up in a day or two. The eggs got too hot. (See heat). The female had a disease. In chickens, Egg Drop Syndrome, avian influenza,Newcastle disease and infectious bronchitis can all impact eggshell and internal egg quality. Should I remove unhatched eggs from the nest? Can I incubate an egg myself? Differences among cavity nesters - I find bluebirds and Tree Swallows tend to leave unhatched eggs, while Black-capped Chickadees remove them from a nest. Last updated April 19, 2017. Design by Chimalis.